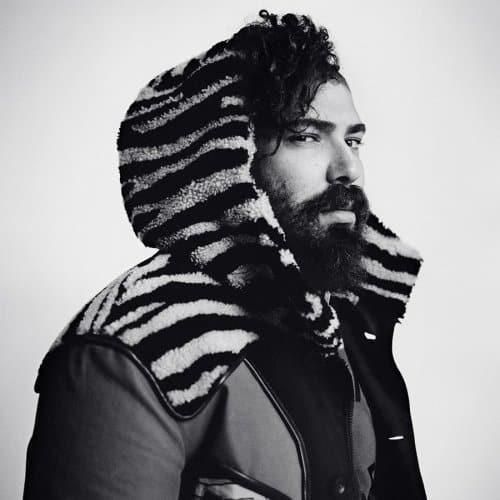 I can’t even explain to my dad what I do for a living,” says Josh Ostrovsky, the rotund raconteur better known on social media as The Fat Jew. “He calls me an ‘adult entertainer.’ ” Ostrovsky is drenched in sweat, because—as he will gladly tell you—he is fat, and fat guys perspire heavily on humid Manhattan afternoons. He’s just arrived at the photo studio, and his frizzy Brillo clump of hair is fluttering in the wake of an air-conditioning unit. What it is, exactly, that Ostrovsky does is a topic of much debate, but you might call him a social-media savant. With 6.1 million followers on Instagram, he uses his account, @TheFatJewish, to curate and create the kind of content that attracts millennials like catnip. Ostrovsky’s comedic posts are an amalgamation of screenshots and memes—culled from the dark corners of the Internet—that riff on subjects the digital generation can’t stop gabbing about, like ruthless hangovers, poor dieting habits and the hilarity of tech-illiterate parents. Though he started out on Instagram in 2009, Ostrovsky didn’t crack the pop-culture zeitgeist until 2013, when his video, “SoulCycle for Homeless People,” went viral in late June. The 76-second clip features the porky jokester in a crop top, teaching a spin class to a handful of hobos sitting on a row of docked Citi Bikes. The video has since been viewed more than a million times. The native New Yorker’s knack for winning the elusive attention of an overstimulated demographic has made him an unconventional yet desirable partner for brands like Bud Light, Virgin Mobile and Burger King. On any given day, the Fat Jew gets more eyeballs than Jimmy Fallon or Stephen Colbert on their broadcasts. “The brands obviously know that I have a trusted voice and that, relatively speaking, I know what’s cool—or at least what’s going to get a conversation started—so they kind of let me do the things I want to do,” says Ostrovsky, who once tattooed a logo of Burger King’s Chicken Fries on his chest and shared it on social media.